How I satisfied my Whedon Superiority Complex. Stephenie Meyers mediocre vampire tales hold no candle to Joss's creations. It's not so much that I dislike them. It's more that I can't stand the overwhelming passion that seems to develop towards Edward and Jacob. I'm going to see the new movie. 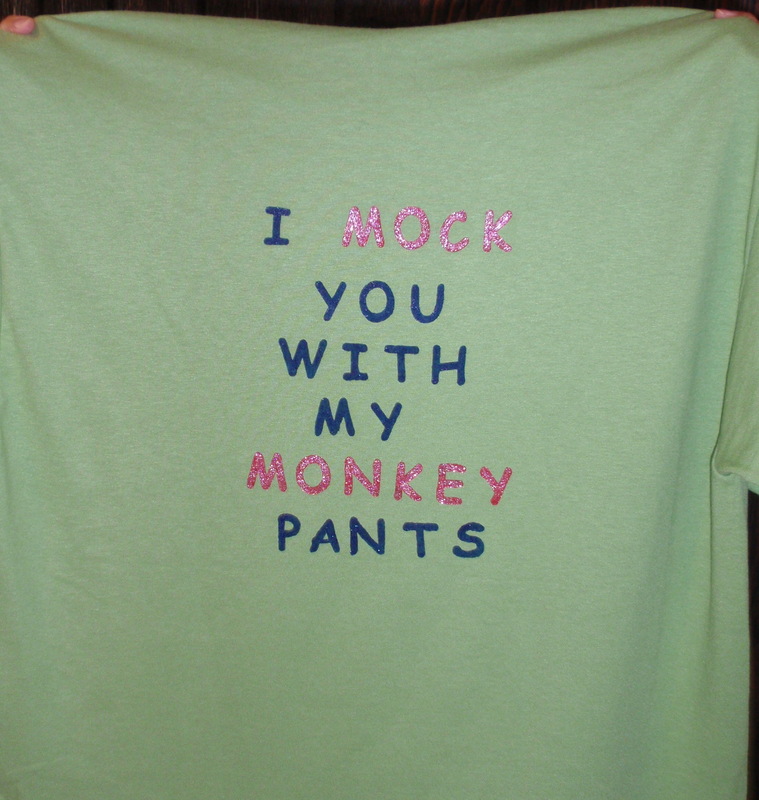 However, my friend wonderlenny and I decided to express our solidarity with the Whedon-verse by creating t-shirts that explain our points of view. This is mine, with Angel's tattoo on the front, and a pertinent BTVS quote on the back. 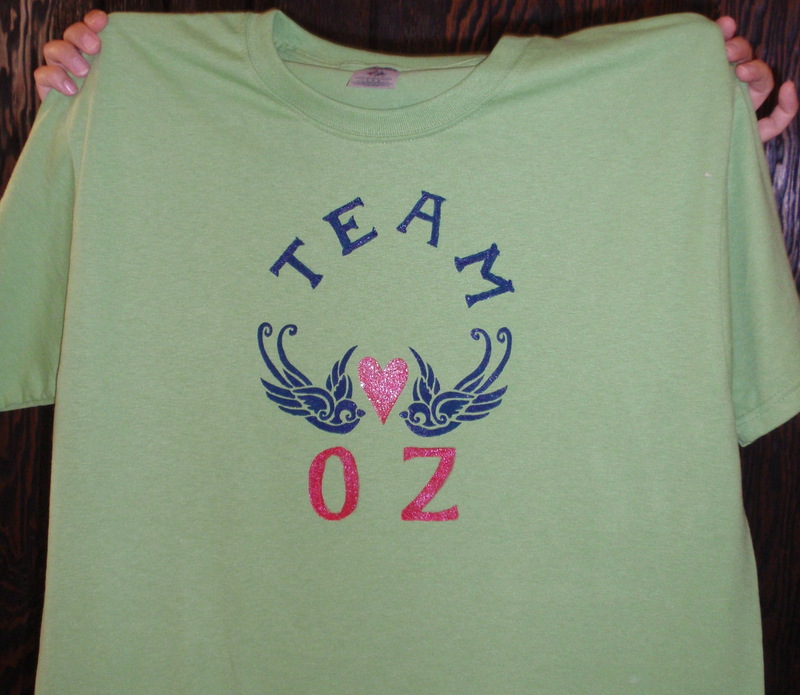 In case people needed to know how awesome Oz is, she quotes him on the back. 1. Whedon as in Joss Whedon. Creator of Buffy the Vampire Slayer, Angel, Firefly, Dollhouse, and Dr. Horribles Sing-a-long blog. Writer, director, cameo actor, comic book creator. 2. I like them anyway. They're a fun tale. Plus the author loves Muse. Sadly that gives her points in my book. I do however object to the shoddy editing of the books. Inexcusable! 3. In the interest of full disclosure, I'm solidly Team Jacob. Slightly less so after having read the "Midnight Sun" excerpt on Meyer's web site. 4. Full disclosure again, it was her idea. I went along for the ride. 5. Gleek points for the reference. I love both shirts! 🙂 YAY! I think I'm seeing Eclipse with Julia at some point. Thanks.I'm kinda impressed with myself. The Angel tattoo drawing looks a lot like the real thing. It represents significant achievement on my part. I'm just not that kind of artistic most days. We may have to wait for video. I know she's on vacation for most of July and I'm on vacation a not-small chunk of August. Dear Edward, She didn't mean it. I love your gay sparkly self. I mean, your manly sparkle…If only Stan would let me hang a poster of you in our room. Don't know why he won't. For the record – I imagine Robert Pattinson would act the same way in a real life love scene as he does in his interviews – all girly and giggly. But I do (sick – yes) love me some Edward! To paraphrase Bill and Ted's Excellent adventure:"John, much like Ozzy Osborne, has been repeatedly accused of corruption of the young." I believe that Fox played a role in it's demise. Even though it switched networks after that, it never regained its viewer power. Tis a shame though. The shows are well crafted. Sadly I have a friend who didn't even realise the films were based on books. I've had to lend her the books before Eclipse comes out! Yes. Stephanie writes like an eighth grader. And her editor might just be in middle school. I did notice some growth throughout the books though. All that aside, Bekki, if you could steal that life size cut out of Edward, I would forever be indebted to you. Yup. I might just have to revisit them soon! 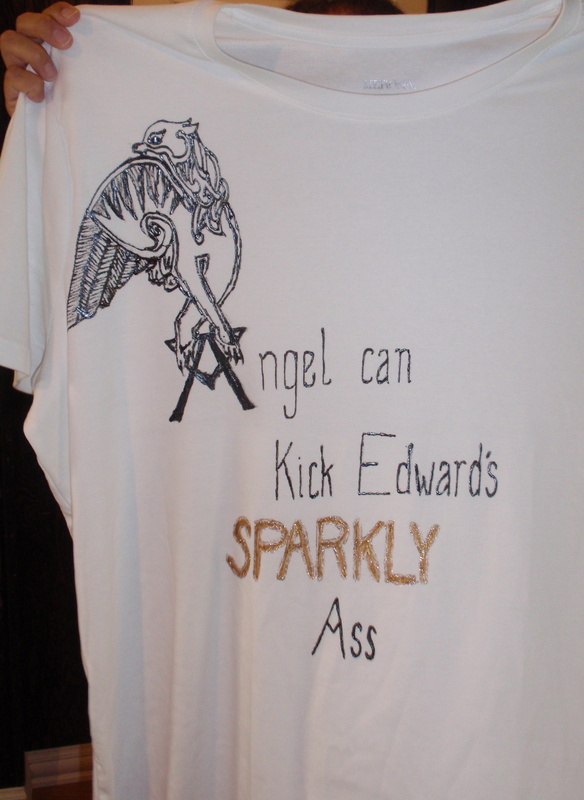 I love both those shirts but the Angel one is probably my favorite!